If two magnets are used side by side, does that double the pull force? We get a lot of questions like this. Our listed Pull Force figures are for a very narrow, specific set of circumstances: a single magnet sticking to a big, thick steel plate. What happens if you use a different setup? Will you get more or less pull force? Our answer is often, “It depends.” We’re not trying to be evasive; it’s just not always a simple thing to answer. Seemingly minor differences in your setup might make a big difference in the pull force you see. Let’s dig deeper into one specific situation: Two magnets side-by-side. Does this setup double the pull force? Or do the magnetic fields interfere with one another? Does the orientation of the magnets matter? We'll try to answer these specific questions here. Hopefully this will also provide some idea of how to approach similar scenarios as well. In Doubled Forces, we shared some insights about what happens when you stack two or more magnets together. Magnets in a stack act like a single magnet with the same overall height. For example, a stack of two 1/8” thick D82 disc magnets has about the same magnetic strength as a single 1/4” thick D84 magnet. 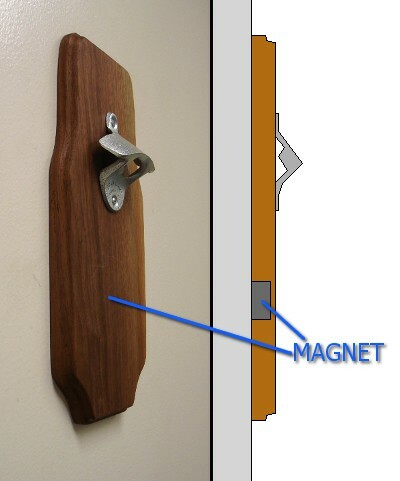 Let’s consider the pull force of two magnets side-by-side, sticking to a thick steel plate. We’ll consider various distances between the two magnets, from a 1" gap between them down to touching side-by-side. We’ll also consider the distance between the magnets and the steel surface they’re attracting to. Each of the magnets has the opposite pole facing the steel plate, i.e. one north pole and one south pole. 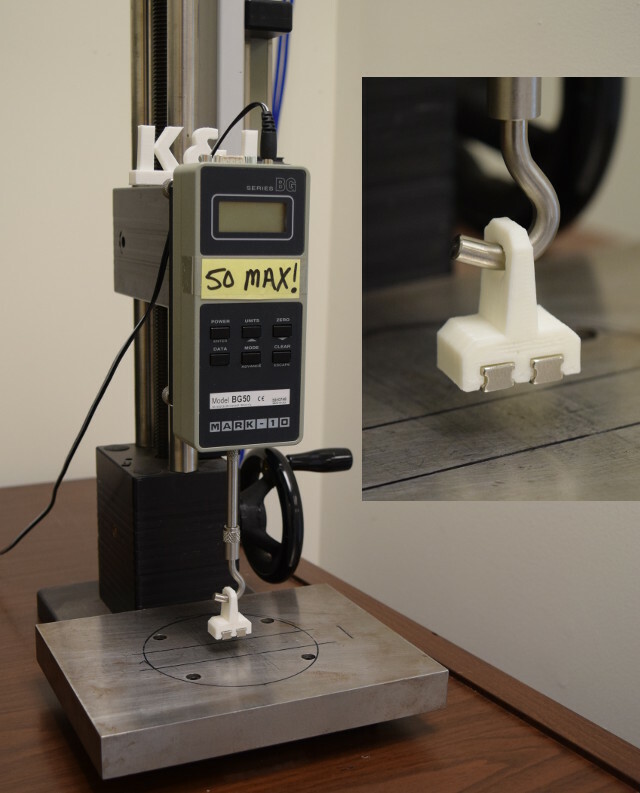 We tested the pull force of two magnets experimentally, in dozens of different setups. To make this process easy, we chose two SB483-IN stepped blocks. These magnets are 1/2" x 1/4" x 3/16" thick blocks, with a groove cut into two sides. This groove allowed us to easily secure the magnet to plastic test fixtures without resorting to glue or adhesives. Before measuring anything, it might be useful to make a logical guess about the results. What should we expect? Let's form a hypothesis about what we expect to see. A single, 1/2" x 1/2" x 1/8" thick B882 block magnet is listed with a Pull Force of 7.34 lb. If we measure one magnet, we should see something close to this. If we measure two B882 magnets that are separated by a very large distance, we expect them not to interfere with one another. With a large gap between them, the pull force should really be twice as much as one magnet, over 14 lb. Now imagine two magnets side-by-side with no gap between them. 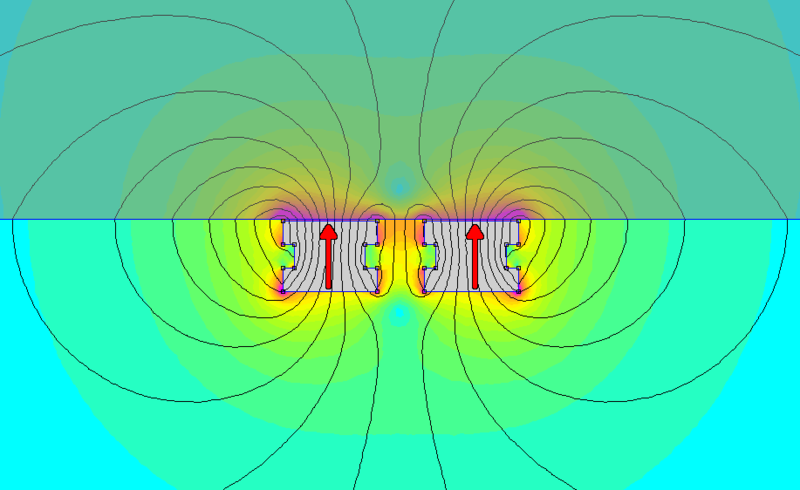 Both magnets have their north poles facing in the same direction; this mimics a single, larger magnet. In this situation, figuring out the total pull force isn’t quite as simple as addition. Because the two magnets affect each other, the pull force is a bit less. Unlike more complex situations, though, we can make a decent guess about the pull force of this setup. 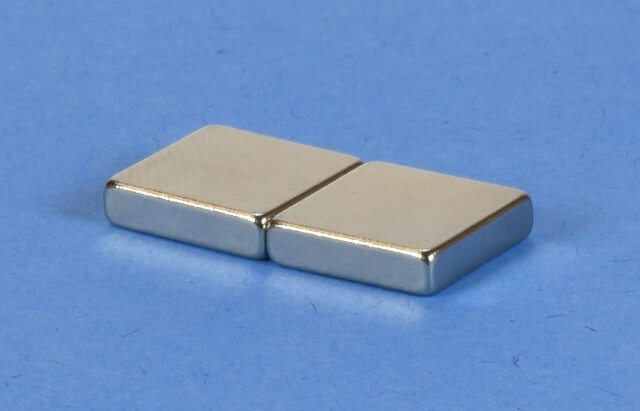 These two magnets are mimicking a single, longer magnet. We can just look up the pull force listed for this 1" long magnet shape, the BX082. This magnet is listed with a pull force of 10.34 lb. That number is only 70% of the pull force we'd expect by simply doubling the one-magnet pull force spec. 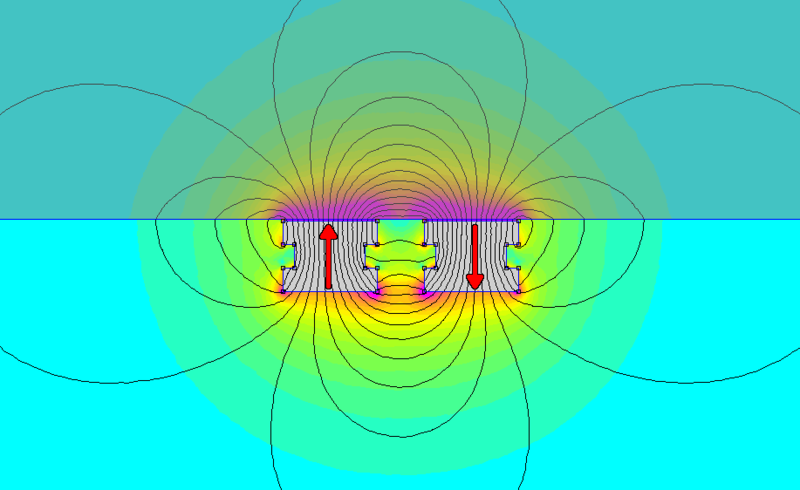 In general, two magnets close together like this will provide a bit less than double the single-magnet pull force. How much less? It depends on the shape of the magnet you’re considering. We estimated a number of sizes this way, making educated guesses using our online Pull Force Calculator. We found that the pull force might be 70-85% of the doubled, single magnet pull force spec. 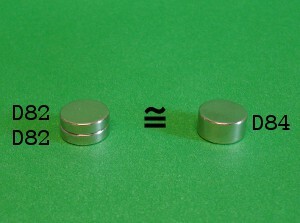 The result depends on the size and shape of the magnet. Gap between magnets: 0" 0.031" 0.063" 0.125" 0.25" 0.5" 1"
Our measurements matched what we expected, mostly. When the two magnets are close to one another, we saw more pull force when the poles are facing in opposite directions. We find less pull force if the poles are facing in the same direction. When the two magnets are far enough apart, the magnetization direction doesn’t seem to matter very much. Our measured data isn't as accurate as we’d like. There’s a lot of noise and unexplained variation. Measuring pull force consistently can be tricky. Pulling on the plastic fixture with two magnets often resulted in one side pulling off first. We’re guessing this noise is because of experimental variation and our minimal amount of measurements. When measuring pull force, we usually make many measurements and average the results. For this article, we just measured each distance once to save time. When we look at magnetic field pictures, it’s not very obvious what the resultant pull force is. They’re interesting pictures, but it’s not like the pull force jumps off the page. We can see that for close distances, two magnets with poles facing the opposite direction does tend to provide a stronger magnetic field in the steel it’s sticking to. This probably explains the greater pull force. Pull force depends on both the field strength and the field strength differential – the difference in field strength in the surface of the steel and the magnet next to it. Does placing the poles in opposite directions always yield better results? No, magnets never seem to be that simple. It depends. 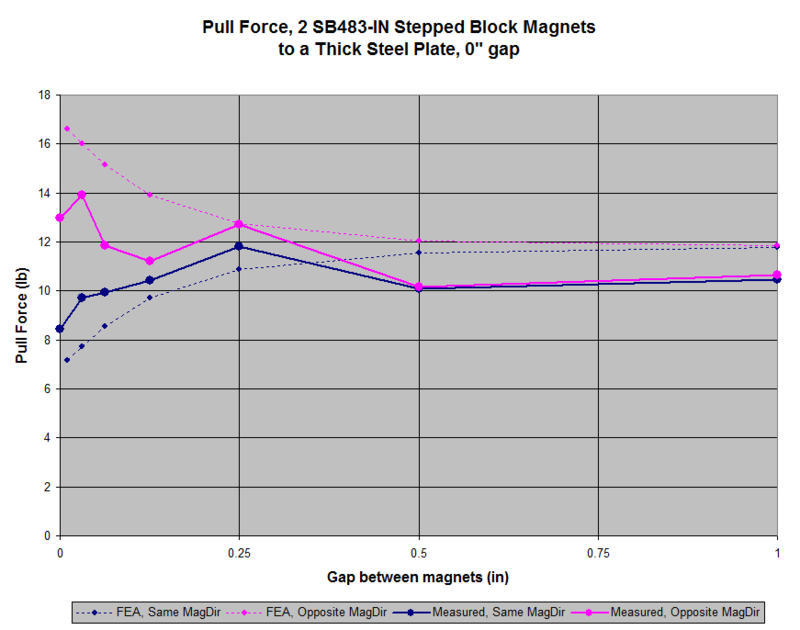 We found that for magnets touching or close to the steel surface, the opposite pole strategy provided more pull force. At larger distances, performance was worse. Two magnets with the same pole facing the steel, mimicking a single, larger magnet, reaches across a larger gap with more force. Mixed conclusions like this aren’t limited to this experimental data gathering project. 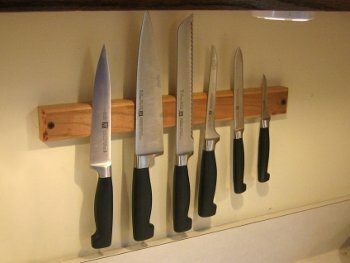 When making a Magnetic Knife Holder, we found the opposite poles setup to be hugely beneficial. Getting a thin steel knife to stick across a small gap, it was much better than a single long magnet. We think this effect might be more pronounced when sticking to thinner steel objects. On the other hand, the goal of our Magnetic Bottle Opener was to catch and hold as many steel bottle caps as possible. The opposite-pole trick provided a stronger pull force to a single cap, but “short circuited” the magnets. It could only hold a few caps. Magnets with the same poles facing out could accumulate a huge pile of caps. Opposite poles facing out didn’t work well at all. In the end, this kind of thinking leads us away from simple, measurable performance specs like pull force. It gets more philosophical. What does “better” mean, anyway? In the case of that bottle cap catcher, maximizing pull force turns out to be a horrible measure of what we really care about – holding the most caps. When choosing magnets for your own project, consider this sort of quick, prototype testing up front. Not only can it provide solid answers about forces you can expect in your specific situation, but early prototyping might also reveal important insights about qualities that are harder to quantify or predict. Want to see all our data? Check out this PDF, where we detail all the distances and measurements we made.